On 18 June 2018, around 7:58 a.m. Japan Standard Time, an earthquake measuring 5.6 Mw on the moment magnitude scale (preliminary 5.5 Mw) struck in northern Osaka Prefecture, Japan. The earthquake's epicenter was near Takatsuki and occurred at a depth of approximately 13 kilometres (8.1 mi). The Japan Meteorological Agency registered a magnitude of 6.1 Mj and an intensity of lower 6 on the shindo scale. Shaking from the earthquake was felt strongly in the prefecture and the nearby metropolitan areas of Osaka and Kyoto, temporarily disrupting electrical and gas service to 170,000 homes and buildings. The earthquake struck during rush hour, disrupting train services for several hours, and also damaged water pipes and hundreds of homes. At least four people have been killed, 15 people have reported serious injuries and 419 people have reported minor injuries. The earthquake occurred at 7:58 a.m. Japan Standard Time on 18 June, with its epicenter in the Takatsuki area of northeastern Osaka, at a depth of approximately 13 kilometres (8.1 mi). 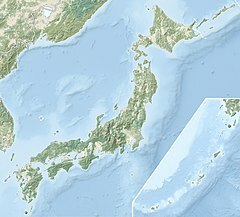 The Kansai region sits atop several active faults, which can produce inland shallow earthquakes. Three of the region's fault zones (Arima-Takatsuki, Uemachi, and Ikoma) are located near the epicenter and are suspected to have caused the earthquake. The Great Hanshin earthquake of 1995 struck nearby Kobe with great intensity, causing thousands of deaths. It was felt strongly in northern Osaka and also affected parts of nearby Kyoto. Within the following week, a total of 40 strong aftershocks were detected by the Japan Meteorological Agency. The earthquake triggered the national earthquake warning system, which set alarms approximately 3.2 seconds for the Osaka and Kyoto areas after the detection of seismic waves. No tsunami waves were generated as a result of the earthquake. The Japan Meteorological Agency assigned an initial magnitude of MJMA 5.9, which it later upgraded to MJMA  6.1 (moment magnitude of 5.6 Mw). The earthquake registered as 6 ("lower 6") on the shindo intensity scale, and the United States Geological Survey reported a magnitude of 5.5 Mw. It was the first time a lower 6 was registered in Osaka Prefecture since 1923 when the government started to keep seismic records. The later research shows that the earthquake source was case of geometrically complex faulting on at least two different faults. The activated strike-slip fault was parallel to the Arima-Takatsuki fault zone (and Itami fault). Next, the activated reverse fault might have a relationship with the deeper segments of the Uemachi fault zone. Shear movements on both of these buried faults contribute significantly to the total seismic moment of this earthquake. Therefore, this event is case of joint movements on multiple faults. The earthquake caused the partial collapse of several buildings, as well as damage to underground water pipes that left residents without running water. A total of 6,766 structures were found by government surveys to have sustained partial damage, primarily in Osaka Prefecture but also including several in Kyoto Prefecture, Nara Prefecture, and Hyōgo Prefecture. As many as 450 people remained in public shelters a week after the earthquake. Roof tiles and stone ornaments at homes and historic temples and shrines fell to the ground. At least 170,000 homes in Osaka were initially under an electrical blackout, but power was restored later in the morning. Gas services were also stopped for over 112,000 households in Ibaraki and Takatsuki for several days, but was fully restored by 25 June. The earthquake disrupted train services, including the Shinkansen, during the morning rush hour but had resumed service six hours later, in time for the afternoon commute. During the shutdown, passengers disembarked from trains and walked along the tracks, due to fears of aftershocks causing further damage. The Osaka Monorail reopened for service on 23 June, but was forced to suspend operations the following day due to the discovery of additional damage to the train cars. Operations at the JXTG Nippon Oil & Energy's oil refinery in Osaka and various manufacturing plants in the Kansai region were suspended to check for damage. Flights at two of the airports in the Kansai region were temporarily suspended, but resumed hours later. There have been four confirmed deaths resulting from the earthquake, including a child in Takatsuki who was crushed by a collapsing wall outside her elementary school. The wall did not meet modern safety codes and prompted Chief Cabinet Secretary Yoshihide Suga to order safety checks of similar concrete block structures at schools across the country. 417 people have also been injured and treated at hospitals. Shortly after the earthquake, Prime Minister Shinzo Abe announced a pledge by the government to assist in rescue and recovery efforts. The Japanese Self Defense Force dispatched several teams to deliver water to residents, at the request of the prefectural government. Fears of landslides triggered by rains and further aftershocks led to hundreds of residents moving into public shelters. The Japan national football team, playing at the 2018 FIFA World Cup in Russia, sent their condolences to the victims of the earthquake. After the earthquake, online rumors of ethnic non-Japanese residents committing dangerous crimes emerged. ^ a b c "M 5.5 - 1km SSW of Takatsuki, Japan". United States Geological Survey. Retrieved 18 June 2018. ^ a b c d e Johnston, Eric (18 June 2018). "At least one feared dead and several injured as strong M6.1 earthquake rocks northern Osakaa". The Japan Times. Retrieved 18 June 2018. ^ a b "Toll rises to five after quake in Japan's Osaka". Retrieved 19 June 2018. ^ a b "With nearly 7,000 quake-damaged homes, focus shifts to rebuilding disaster-hit areas". Mainichi Daily News. 25 June 2018. Retrieved 25 June 2018. ^ Kimura, Reo; Hirata, Naoshi (1 August 2018). "The Earthquake in Ōsaka-Fu Hokubu on 18 June 2018 and its Ensuing Disaster". Journal of Disaster Research. 13 (4): 813–816. doi:10.20965/jdr.2018.p0813. ^ "Three Fault Zones May Have Been Involved in Osaka Quake". NHK. 21 June 2018. Retrieved 29 June 2018. ^ a b "Japan earthquake: Death toll climbs after 6.1 temblor strikes Osaka". CBS News. Associated Press. 18 June 2018. Retrieved 18 June 2018. ^ "Tremors continue to rattle Osaka a week later". NHK. 24 June 2018. Retrieved 29 June 2018. ^ "緊急地震速報の内容" [Contents of emergency earthquake bulletin] (in Japanese). Japan Meteorological Agency. 18 June 2018. Retrieved 18 June 2018. ^ "報道発表-平成３０年６月１８日０７時５８分頃の大阪府北部の地震について" [Press release regarding the earthquake in northern Osaka Prefecture around 07:58 on 18 June] (in Japanese). Japan Meteorological Agency. 18 June 2018. Retrieved 18 June 2018. ^ Ikeda, Tomohiro (18 June 2018). "Powerful quake that jolted northern Osaka Pref. occurred near fault zone". The Mainichi. Retrieved 19 June 2018. ^ Kato, Aitaro; Ueda, Taku (2019). "Source fault model of the 2018 Mw 5.6 northern Osaka earthquake, Japan, inferred from the aftershock sequence". Earth, Planets and Space. 71: 11. ^ a b Hallo, Miroslav; Opršal, Ivo; Asano, Kimiyuki; Gallovič, František (2019). "Seismotectonics of the 2018 northern Osaka M6.1 earthquake and its aftershocks: joint movements on strike-slip and reverse faults in inland Japan". Earth, Planets and Space. 71: 34. ^ a b c "Strong quake in Osaka leaves casualties". NHK. 18 June 2018. Retrieved 18 June 2018. ^ "Osaka quake exposes Japan's aging infrastructure". Nikkei Asian Review. 19 June 2018. Retrieved 19 June 2018. ^ a b "Local authorities say more than 6,000 structures were damaged in recent Osaka earthquake". The Japan Times. 25 June 2018. Retrieved 29 June 2018. ^ "Osaka takes stock a week after violent rush-hour quake". The Japan Times. 25 June 2018. Retrieved 29 June 2018. ^ a b c Yamaguchi, Mari; Moritsugu, Ken (18 June 2018). "Strong earthquake near Osaka, Japan, kills 4, knocks over walls". Chicago Tribune. Associated Press. Retrieved 18 June 2018. ^ Ives, Mike (18 June 2018). "Japan Earthquake Kills at Least 3 Near Osaka, Injuring Hundreds More". The New York Times. Retrieved 19 June 2018. ^ "Japan's Osaka Gas resumes supplies after last week's quake". Reuters. 25 June 2018. Retrieved 29 June 2018. ^ "Japan quake: Strong tremor shakes Osaka, killing at least 5". CNN. 18 June 2018. Retrieved 19 June 2018. ^ "Shinkansen resumes as some railways remain halted in Osaka". The Asahi Shimbun. 18 June 2018. Retrieved 19 June 2018. ^ "Strong earthquake hits near Osaka in western Japan, several feared dead". The Straits Times. 18 June 2018. Retrieved 18 June 2018. ^ "Magnitude 6.1 quake in Japan's Osaka area kills three, stops factories". Reuters. 18 June 2018. Retrieved 18 June 2018. ^ "Yahoo analysis finds traffic jams nearly doubled after Osaka quake". The Japan Times Online. 5 July 2018. Retrieved 5 July 2018. ^ "死者５人から４人に　８１歳女性は病死". Mainichi Daily News (in Japanese). Retrieved 29 June 2018. ^ "Abe pledges all-out effort to deal with quake". NHK. 18 June 2018. Retrieved 18 June 2018. ^ "大阪府における給水支援に係る災害派遣について（２０時００分現在）" [Osaka prefecture earthquake: Disaster response team dispatch and water supply support (As of 20:00)] (PDF) (in Japanese). Ministry of Defense. 18 June 2018. Retrieved 22 June 2018. ^ "People pile into shelters in quake-hit Osaka Prefecture as rains stir landslide fears". The Japan Times. 20 June 2018. Retrieved 22 June 2018. ^ MacSwan, Angus (18 June 2018). "Japan World Cup team send condolences to those affected by Osaka quake". Reuters. Retrieved 18 June 2018. ^ Osaski, Tomohiro (19 June 2018). "Different disaster, same story: Osaka quake prompts online hate speech targeting foreigners". The Japan Times. Retrieved 19 June 2018.